Black Gate » Articles » Announcing the Winners of The Watcher at the Door: The Early Kuttner, Volume Two! 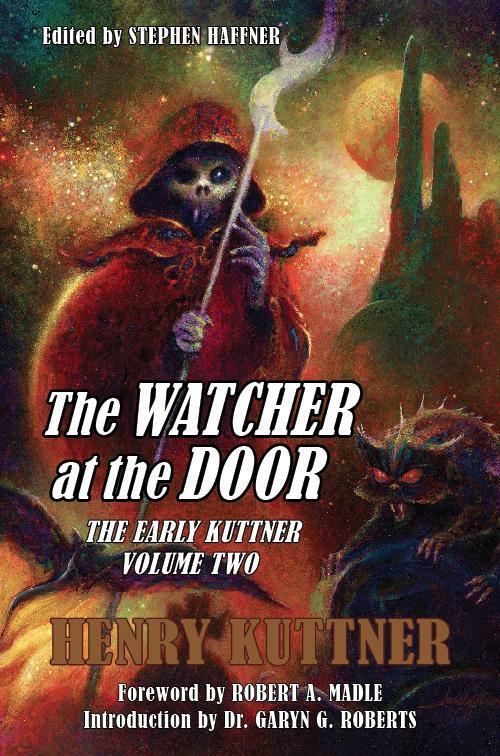 Announcing the Winners of The Watcher at the Door: The Early Kuttner, Volume Two! We had a near-record number of entries in our latest contest. Not too surprising, as this time we’re giving away two copies of The Watcher at the Door: The Early Kuttner, Volume Two, the latest archival quality hardcover from Haffner Press. This gorgeous book is a massive collection of 30 early weird fantasy tales by Henry Kuttner, and readers have been asking about if for months. We first gave you a sneak peek back in April 2015. How did you enter? All you had to do submit the title of an imaginary weird fantasy story. The most compelling titles — as selected by a crack team of Black Gate judges — were entered into the drawing. We drew two names from that list, and the two winners will both receive a free copy of The Watcher at the Door, complements of Haffner Press and Black Gate magazine. So let’s get right to it. The first job was to select the Top 25 entries from the numerous submissions we received over the past 9 days — no easy task, let me tell you. But after much agonizing debate (and two brief fist fights), here are the judges selections. Bob Cooper — Give Me Back My Heads! Amy Bisson — The Crystal Scimitar of Doom! That’s a dynamite anthology of weird fantasy, right there. Congratulations to the winners! And thanks to everyone for entering. The Watcher at the Door: The Early Kuttner, Volume Two is 700 pages in high-quality hardcover format, with an introduction by Dr. Garyn G. Roberts and a foreword by Robert A. Madle. It is edited by Stephen Haffner, and was published October 28, 2016. The cover price is $45. Cover art is by Jon Arfstrom. See the complete TOC here. The book is available directly from Haffner Press. Wow — I WON something! Unbelievable — I never do. Now I have to work on the story that the title belongs to — YOW! No Christmas holiday for me. Thanks to the judges! I’ll try to do justice to the story. And don’t forget to send me your address!